In the event of a mis-feed an auto-sensor will trigger the machine to reverse automatically allowing you to re-align the pouch. A unique AutoSense system will detect the thickness of the pouch and will automatically adjust to the optimal temperature. Sleep Mode is activated after periods of inactivity in order to reduce energy consumption. The Fellowes Jupiter 2 A3 is a high performance laminator for moderate office use. 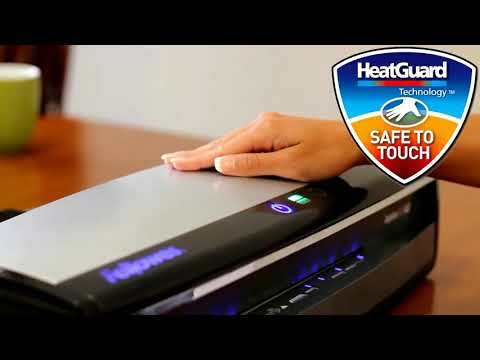 With InstaHeat Technology it warms up in just 60 seconds and AutoSense technology detects pouch thickness and then self adjusts to the optimal laminating setting. With a 320mm entry width and six temperature settings, the Jupiter 2 can handle a multitude of laminating applications. The carrier-free, 6-roller system ensures high quality lamination for documents and photos. Includes multiple temperature settings for laminating pouches from 80 to 250 microns thick and a cold setting for laminating heat-sensitive materials in self-adhesive pouches. The Jupiter 2 A3 is extremely fast and can laminate an A4 pouch in as little as 24 seconds. The machine features a green light and audible beep signal when the laminator is ready. A reverse mode disengages the pouch for re-centring or removal. The accessible machine design opens up for cleaning, maintenance, or removal of misfed sheets and an auto shut-off prevents overheating when not in use. A starter kit for 10 documents is included with this machine.